Need a ride to the train station, Bolt Bus, or airport for break but don’t want to pay outrageous cab fares or spend an hour on a crowded bus? Take the Pilot Express! 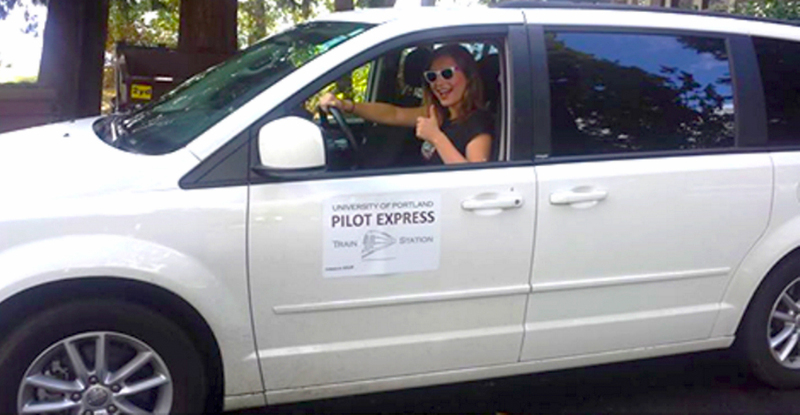 The Pilot Express is a student run service that drives students to and from the train station, the airport, the bus station, and the bolt bus station for breaks. Please note: Because this is a student-operated service, the shuttle does NOT operate In August before the school year begins OR after the school year ends in May. If you have a disability and need wheelchair accommodation for rides to the airport or train station during breaks, please contact the Pilot Express director in order to request wheelchair accessible transportation. Sign-ups begin two weeks before each break and cannot be done over the phone. Come to the Office of Student Activities in St. Mary's Student Center during the sign up period. Business hours are 8:30 a.m.-6:00 p.m., Monday-Thursday; 8:30 a.m.-5:00 p.m. Fridays. Bring your flight/train/bus information and the appropriate amount of money to pay for your trip. See below for current rates. Each ride is limited to 6 passengers, except during the Christmas Break when increased luggage requires us to limit each ride to 5 passengers. After you sign up, you will receive a confirmation email that details where to meet the shuttle, both departing and arriving, what to do if your travel plans change, contact information for the director, and a place to make a note of the details of your rides. Please note: refunds for Pilot Express runs will only be considered if the refund is requested prior to the day first day of break. Looking for more information on Transit and Travel? Department of Public Safety has more information about how to get around in Portland. Need more information about Pilot Express?